I absolutely love doing my nails and my favourite type of nail polish is anything with glitter, I'm a little bit glitter obsessed. 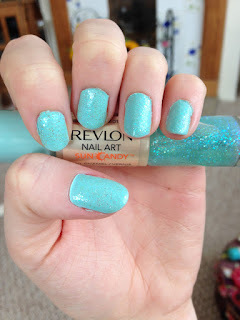 So when Revlon Nail Art came out with the new range Sun Candy, I was in glitter heaven and the shades are absolutely gorgeous!!! They are perfect for Summer and there are quite a few shades which means plenty of choice! :) I have one nail varnish from the Moon Candy collection which have more darkish colours whereas the Sun Candy range is lighter and brighter. I bought the Sun Shower (490) shade and it's beautiful, it's a turquoise colour and it adds a bright touch to my nails. I was looking for a nail varnish for my friend and ended up buying one for myself. I adore it and will definitely buy more of the Sun Candy range, they are my type of colours!